Approaching to "borderline region mathematics," where algebra, geometry and analysis all together come to interplay, by using new notions of spaces, which expand and strengthen the hitherto known algebro-geometric spaces. Topics that deal with infinite quotients, such as those appear in uniformizations. Degeneration of geometric objects is, admittedly, a fairly classical topic in algebraic geometry; but it often exceeds the realm of classical algebraic geometry, as it relates itself quite naturally with analytic geometry and number theory through, for example, analysis of period maps in Hodge theory. It is here that the other topic, uniformizations, often comes to interplay, giving rise to, furthermore, at least in the classical situation, the studies in the rich field of function theory and the theory of algebraic differential equations on algebraic/arithmetic varieties. This last-mentioned mathematical playground, in which "degenerations" and "uniformizations" are so deeply interwoven, is a very interesting fertile land in mathematics, in which algebraic geometry, analytic geometry, function theory, and even number theory play fundamental roles. It can be also said that, historically, lots of mathematical streams flow from this region; even algebraic geometry itself, having stemmed from the meeting point, essentially in the works of Riemann, of the theory of elliptic functions and projective geometry, originates from this parts of mathematical world. One can think of this mathematical region, therefore, as "fertile crescent" in mathematics. Rigid spaces --- in rigid geometry. Log geometry --- geometry of degenerations. Log geometry is a relatively new theory of geometry, developed by J.-M. Fontaine, L. Illusie, and K. Kato in late 1980s. The most characteristic feature of this new geometry lies in its notion of log smoothness, by which one is able to treat non-singular varieties and singular varieties of some sort, such as the ones obtained from semi-stable degenerations of smooth varieties, within the uniform category, pretending that they all together are "smooth." This notion of the "new smoothness," so to speak, provides entirely new viewpoints in the treatment of degenerations of algebraic varieties and various related arithmetic phenomena. A. I developed in my master thesis in Kyoto university  the so-called log smooth deformation theory, which aims at a general deformation theory framework that allows not only classical smooth deformation but also degeneration of algebraic varieties. This theory has been cited by many authors, applied not only to the classical algebro-geometric problems related to global smoothing of normal crossing varieties, but, recently, also to various problems in mathematical physics related to, for example, mirror symmetry. B. I applied my log smooth deformation theory to the moduli theory of algebraic curves. This is done in my doctor thesis in Kyoto University . This piece of work actually turns out to be the first systematic endeavor to discuss moduli theory in the framework of log geometry. Notice that, due to the notion of log smoothness, moduli spaces of "smooth objects" in log geometry almost automatically contain some appropriately selected degenerations, and thus are, in many cases, expected to be "compact" from the beginning. This is the reason why moduli theory in log geometry should come as a natural thing to study. In this connection, it deserves mentioning here that, in recent years, the moduli spaces of the so-called log stable maps have become the object of active research in connection with mirror symmetry and Gromov-Witten invariants in mathematical physics. C. It is natural to expect that, in many situations, geometry of degenerations is associated with several analytic problems through, for example, the theory of limiting Hodge structures. I discussed in  the "log-generalization" of Poincaré lemma and de Rham theory. This piece of work has later been applied to the so-called log Hodge theory by K. Kato and S. Usui. Rigid geometry --- analytic approach to arithmetic geometry. Rigid geometry is a new framework of geometry, introduced by J. Tate around 1960 first as an "analytic" geometry over non-archimedean valued fields, such as p-adic fields. Although this framework has initially sprouted from the attempts to "copy" complex analytic geometry to the non-archimedean situation, and is, in this respect, perhaps the most successful one among several such attempts at the time when it appeared, it has many aspects that look quite different from complex analytic geometry. For example, rigid geometry has the notion of "analytic reduction," which is, so to speak, an "analytic" analogue of the usual mod-p-reduction. It turns out that, in fact, the presence of these differences is highly essential, and it is basically due to this feature of the theory that, unlike complex analytic geometry, rigid geometry can be applied to diverse kinds of number-theoretic problems, such as rational points of elliptic curves. One of the most important aspects of rigid geometry lies in that it enables one to deal with "infinite" objects and operations, such as infinite coverings and quotients, within the context of arithmetic geometry. This theory, the theory of the so-called non-archimedean uniformizations, admits extremely broad applications, giving very effective and useful technical devices in, for example, constructing interesting arithmetic varieties, such as Tate elliptic curves, Mumford curves and the famous Mumford's "fake projective plane," and also in investigating arithmetico-geometric structures and mod-p-reductions of arithmetic varieties. Moreover, quite interestingly, the uniformization thus described in the p-adic side is, when the group is arithmetic in an appropriate sense, closely related with the usual uniformization in the complex analytic side through its arithmetic backgrounds (the theory of p-adic uniformization of Shimura varieties). A. My interest in rigid geometry stems from the past works on fake projective planes , which I started when in the master course. As a natural extension of these works, I have been interested in the quotients by infinite discrete groups that contain finite-order elements (non-archimedean orbifold uniformizations) and have aimed at constructing the general theory of them. In dimension one, such a general theory has already been done, partly by the collaboration with Gunther Cornelissen and Aristeides Kontogeorgis ; one finds the general treatment of this theory in . An interesting by-product obtained from this thread of study is the notion of p-adic Schwarzian triangle groups, which are, of course, related with some of the p-adic Gaussian hypergeometric differential equations. Not only the groups, but one is also interested in the related geometrical objects; when the groups in question are finite, they should be the "p-adic analogue" of regular platonic solids. The p-adic icosahedron  has been thus obtained. 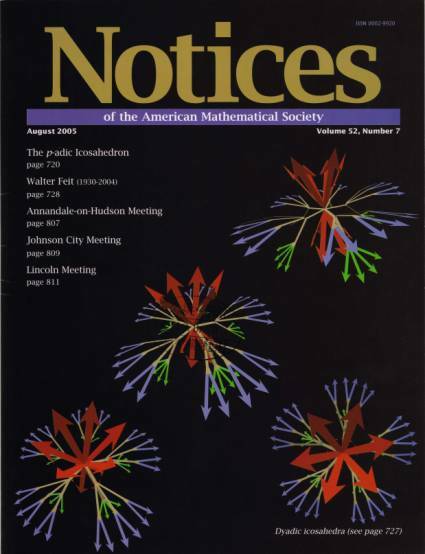 The 2-adic icosahedron was depicted in the front cover of Notices AMS 52, No.7 (2005) (see the picture below). Finally, there is recent progress in the theory of non-archimedean orbifold uniformizations in higher dimensions in the collaboration with Daniel Allcock . B. After Tate introduced his rigid geometry, Raynaud gave another way of approaching to it. Since then, several other approaches have appeared. This is of course a desirable situation, for we can choose, according to what we want to do, the most appropriate one from the bunch of possible approaches to rigid geometry. But, at the same time, one wants to have more unified and consistent picture, which would explain clearly the interrelations between these approaches. Since around 2003, Kazuhiro Fujiwara in Nagoya and I have promoted the book project "Foundations of rigid geometry," in which we attempted to put the whole theory of rigid geometry on more general and sound bases, and thus to provide more clean and unified pictures of the entire theory. The most difficult point of the project lies in that, in rigid geometry, one cannot rely on Grothendieck's EGA, since schemes and formal schemes that appear in the context of rigid geometry are almost always not Noetherian. This implies that, in order to provide a sound enough foundations of rigid geometry, one has more or less to reconstruct quite a few portions of EGA, and implement more powerful and broadly applicable devices and techniques. The first volume of the book  has already appeared from European Mathematical Society publisher. Kato, F.: Log smooth deformation theory. Tohoku Math. Journal, 48 (1996), 317-354. Kato, F.: The relative log Poincare lemma and relative log de Rham theory. Duke Math. Journal, 93 No.1 (1998), 179-206. Kato, F.: Functors of log Artin rings. Manuscripta Mathematica, 96 (1998), 97-112. Ishida, M-N.; Kato, F.: The strong rigidity theorem for non-archimedean uniformization. Tohoku Math. Journal, 50 (1998), 537-555. Kato, F.: Log smooth deformation and moduli of log smooth curves. International Journal of Math., 11 (2000), 215-232. Kato, F.: Mumford curves in a specialized pencil of sextics. Manuscripta Mathematica, 104 (2001), 451-458. Cornelissen, G.; Kato, F.; Kontogeorgis, A.: Discontinuous groups in positive characteristic and automorphisms of Mumford curves. Math. Ann., 320 (2001), 55-85. Cornelissen, G.; Kato, F.: Equivariant deformation of Mumford curves and of ordinary curves in positive characteristic. Duke Math. Journal, 116 (2003), 431-471. Cornelissen, G.; Kato, F.: Mumford curves with maximal automorphism group II: Lame type groups in genus 5-8. Geom. Dedicata, 102 (2003), 127-142. Cornelissen, G.; Kato, F.: Mumford curves with maximal automorphism group. Proc. Amer. Math. Soc., 132 (2004), 1937-1941. Kato, F.: Non-archimedean orbifolds covered by Mumford curves. Journal of Algebraic Geom., 14 (2005), 1-34. Cornelissen, G.; Kato, F.: Zur Entartung schwach verzweigter Gruppenoperationen auf Kurven. J. Reine Angew. Math., 589 (2005), 201-236. Inoue, N.; Kato, F.: On the Geometry of Wiman's Sextic. J. Math. Kyoto Univ., 45, No.4, (2005) 743-757. Kato, F.; Ochiai, H.: Arithmetic structure of CMSZ fake projective plane. Journal of Algebra, 305 (2006), 1166-1185. Kato, F.: On the Shimura variety having Mumford's fake projective plane as a connected component. Math. Z., 259 (2008), 631-641. Cornelissen, G.; Kato, F.; Kontogeorgis, A.: The relation between rigid-analytic and algebraic deformation parameters for Artin-Schreier-Mumford curves. Israel J. Math., 180 (2010), 345-370. Fujiwara, K.; Gabber, O.; Kato, F.: On Hausdorff completions of commutative rings in rigid geometry. Journal of Algebra, 322 (2011), 293-321. Byszewski, J.; Cornelissen, G.; Kato, F.: Un anneau de déformation universel en conducteur supérieur. Proc. Japan Acad. Ser. A Math. Sci. 88 (2012), no. 2, 25-27. Allcock, D.; Kato, F.: The densest lattices in PGL3Q2. Adv. Math. 242 (2013), 102-115. Fujiwara, K.; Kato, F.: Foundations of Rigid Geometry I. EMS Monographs in Mathematics, European Mathematical Society Publishing House, Jan. 2018. Cornelissen, G.; Kato, F.; Kool, J.: A combinatorial Li-Yau inequality and rational points on curves. Math. Ann. 361 (2015), no. 1-2, 211-258. Kato, F.; Ohnoshi, K.: Buchberger stratification on the space of polynomials. Kumamoto J. Math. 28 (2015), 1-10. Allcock, D.; Kato, F.: A fake projective plane via 2-adic uniformization with torsion. Tohoku Math. Journal, 69 (2017), 221-237. Kato, F.: On Henselian rigid geometry. Algebraic Geometry in East Asia - Tokyo 2016, Taiwanese J. Math., 21 (2017), 531-547. Cornelissen, G.; Kato, F.: The p-adic icosahedron. Notices Amer. Math. Soc., 52, No.7 (2005), 720-727. Fujiwara, K.; Kato, F.: Rigid Geometry and Applications. In Moduli Spaces and Arithmetic Geometry (Kyoto, 2004), Advanced Studies in Pure Mathematics, 45 (2006), 325-384. Kato, F.: Topological rings in rigid geometry. Motivic integration and its interactions with model theory and non-Archimedean geometry. Volume I, 103-144, London Math. Soc. Lecture Note Ser., 383, Cambridge Univ. Press, Cambridge, 2011. Kato, F.: Introduction to rigid geometry (Japanese), Surikaisekikenkyujo Koukyuroku, 1073 (1998), 1-48.